Ahh, I love the holidays. Tons of guiltless eating, appropriate daytime sequins and lots of parties. It's a wonder I've found the time to lust after new products ... but somehow I have! Check out what I'm totally loving this week. Chanel Trio Exclusif de Vernis: My love for all things Chanel has definitely taken on a whole new level with this limited-edition set. Three utterly gorgeous colors -- Allegoria (pale, creamy pink), Tulipe Noir (shimmery burgundy) and Rouge Noir (creamy marroon) are packaged within a super-chic black satin case that doubles as an evening clutch. My nails have been shimmering, sparkling and pretty much singing for joy since I painted them! Alterna HEMP with Organics Spray Leave-In Conditioner: I'm fairly partial when it comes to my hair. I tend to not change things up unless I have a really good reason. And this bottle alone convinced me to give it a try -- because it's so different, so cool, I just had to check it out. And wow, am I glad I did! I am now totally a convert to this handy dandy spray, which really seems to work with only five or six good spritzes all over the hair. My hair has never been shinier or glossier, and it's full without being frizzy or mushroom-esque. Not to mention it smells pretty darn good! 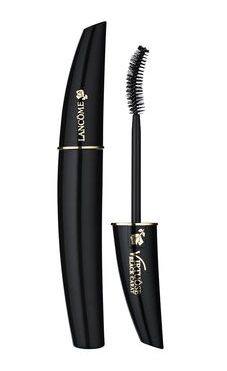 Lancome Virtuose Black Carat Mascara: It takes a lot to pull me away from the fabulousness of my Diorshow. (Click here for the proof.) And while I would still put that mascara at number one, this baby really does come close to imitating the fabulousness Diorshow lends my lashes. The curved brush really tackles each and every individual lash, lengthening and thickening them in just one coat. Two coats and they literally hit my glasses! I've been using it in Black, which really makes my dark lashes stand out more than I thought possible. Plus the formula lasts for hours -- even through tearing up when the cold wind hits my face!